BoardVitals™ is the largest and most used question bank for In-Service exams, Board Exams, Shelf Exams, and Physician Re-Certifications. 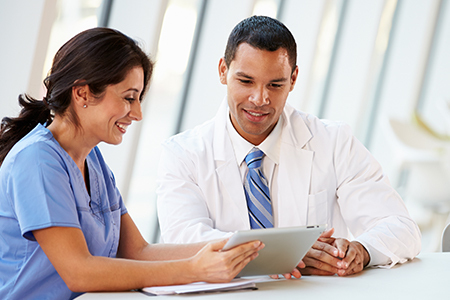 We provide 20,000 questions, answers, and explanations targeted to 17 Medical Specialties. Providing the highest quality content, BoardVitals doesn’t just provide a question bank, they provide up-to-date explanations from the literature with their answers and give detailed feedback and an assessment of progress broken down by subject areas. With each question, users can see how they compare to their peers and gauge the difficulty of the question by what percentage of peers answered it correctly or chose the same option. The BoardVitals full-length practice exam is a great way to judge overall preparedness and estimate what scoring might be on the real thing. From reputable and trusted sources, BoardVitals content is referenced to many major dermatology, surgery, pediatric, cardiology, gastroenterology, obstetrics, gynecology, emergency medicine, internal medicine, family medicine, pathology, cytology, laboratory, psychiatry, neurology, nursing, surgical tech and psychopharmacology texts, and journals. BoardVitals is a high-quality, effective and powerful board review tool that can be used anytime and anywhere via a phone, tablet or computer. COMLEX® or COMLEX-USA® are registered trademarks of the National Board of Osteopathic Medical Examiners, Inc. Teton Data Systems Makers of STAT!Ref is not affiliated with the NBOME and the NBOME does not review or endorse our company's products. Earn CME Hours Online. BoardVitals offers an easy way to complete all Continuing Medical Education (CME) requirements quickly, easily, and on schedule. BoardVitals has AMA PRA Category 1 Credits™ (state and national requirements), Category 2 (MOC points and hours/SAM credits), and is intended for preparation for Category 3 (Maintenance of Certification Exam). In fact, BoardVitals is the only provider to offer Category 2 CME institutionally! BoardVitals users can prepare for their recertification exams while earning the mandatory CME hours. A single self-assessment activity enables users to complete their annual CME requirements in less than a day. Content is compiled by over 200 medical specialists who have prepared for and taken the recertification exams and BoardVitals content is certified by IPMA. The primary author for each question bank is board certified in that specialty, and, in most cases, has taken and passed the initial or re-certifying exam within the past few years. The vast majority of the BoardVitals primary authors have scored in the top tier on their Step exams. In addition to the primary author, BoardVitals typically contracts with dozens of writers for each question bank. From those, they usually keep about a third. Each of the writers are assigned a specific portion of the blueprint for their specialty/sub-specialty. BoardVitals uses a multi-tiered editing process. Each question from the author and the contractors are run past their internal team of medical editors, which checks for medical accuracy, grammar, formatting, and that the content follows the blueprint. The content is then continually updated based on feedback from faculty and students. The feedback loop goes to the BoardVitals editors, who review each piece of feedback. New updates are added as the feedback is verified. They process hundreds feedback emails per week, many of which suggest updates or fixes across their 60,000+ questions. Please take a moment to check out this brief overview of "BoardVitals". Here are some handouts, posters and videos to get you started. Most Comprehensive online board review resource for numerous specialties I have seen. Excellent quality and quantity of questions available. Wish I had this sooner. 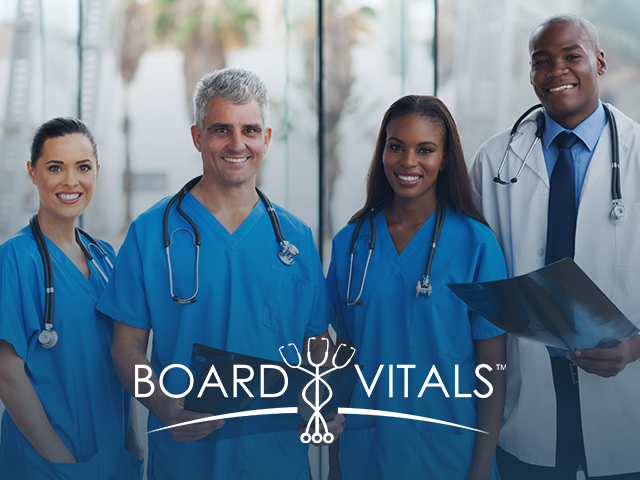 Board vitals is the ideal complementary review source for any resident seeking to maximize their board exam review. The otolaryngology questions challenge you to apply your knowledge of frequently-tested ENT principles in a variety of fields, ranging from otology and facial plastic and reconstructive surgery to pediatric otolaryngoloy and head & neck oncology. Each question is written in a board-style format and each answer offers a detailed review of key concepts. Otolaryngology residents, myself included, have been waiting for this type of review material to be available to us and it's finally here. I highly recommend it! BoardVitals is a great adjunct to your study materials when preparing for the NBDE II. The questions help to prepare you well for the exam and cover a wide variety of important topics. The ease of completing the practice questions online at your convenience is one of the strengths of the resource. In addition, the detailed answer explanations help to review the important concepts and take away points from the question. I highly recommend it! This question bank is exactly what I need to prepare to take my pediatric boards. The scope of the material is extremely high yield and really focuses on what I need to know to be most success ful when taking the boards. The answer discussions for each question are well written and are mini-lectures in and unto themselves. I would recommend this question bank to anyone looking to improve their general pediatric knowledge. Several of our May BSN grads who have passed the NCLEX have stopped in to say hi. Uniformly, they've said how great BoardVitals is! The BoardVitals neurology question bank questions challenge your clinical knowledge while providing detailed and clear explanations that add to your understanding of the pathophysiology of the neurosciences. This is a great way to beef up your knowledge for the boards and RITE exams!